This story originally appeared on Jan. 17, 2014. One day in high school, I was out with classmates when my friend Danny abruptly reached into his pocket and threw something high into the air. He immediately ducked behind a car and, sensing danger, the rest of us ran behind a wooden fence. Suddenly there was a loud bang and metallic zinging noises. Danny had taken a shotgun shell, removed the buckshot and packed it with gunpowder. He rolled the shell in epoxy and rolled it again in steel nuts and washers. He taped streamers made of paper to the tail so the device would always orient in the same direction. The final touch was a nail, pointy end taped against the explosive primer. Then he threw it in the air in the middle of his group of friends. On the third try, it went off. Danny had made his own hand grenade. Even then, in high school, I didn’t actually think it would work. It seemed like something Wile E. Coyote would make to take down the Roadrunner. Still I ducked, just to be sure—and it was a good thing that I did. This was my introduction to the world of The Poor Man’s James Bond, the DIY guide for anarchists, far-right reactionaries, survivalists and mischievous high school boys. 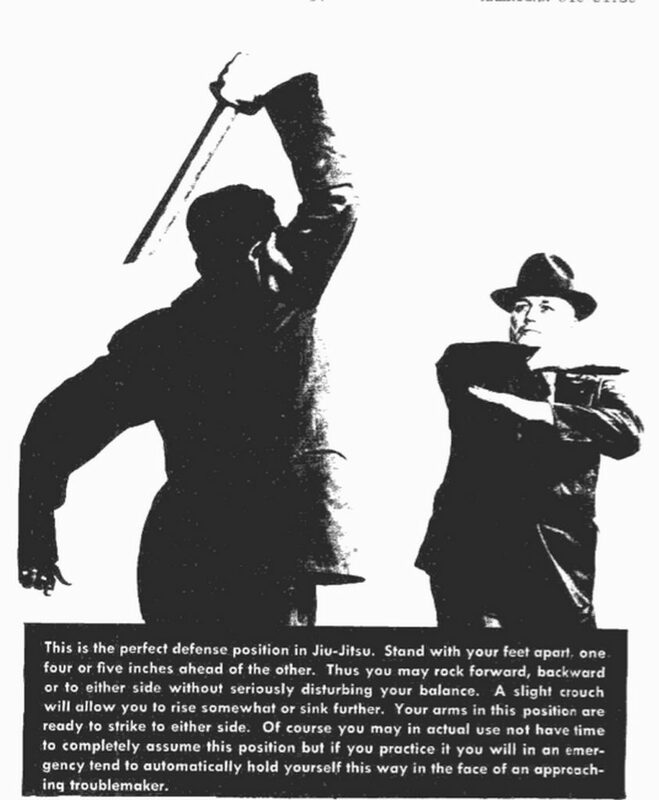 The Poor Man’s James Bond was a newsletter produced by Kurt Saxon, a prolific writer on survivalism and improvised weapons. Saxon’s real name was Donald Eugene Sisco. In the 1960s, he flirted with a host of extremist groups and cults. Saxon claimed to have belonged at various times to the American Nazi Party, the John Birch Society, Scientology and the Church of Satan. In testimony to the U.S. Congress in 1970, he revealed he had been proofreader at The Los Angeles Herald-Examiner newspaper. Saxon started his career with the books Militants’ Formulary and Explosives Like Granddad Used To Make, both how-to guides on all sorts of hazardous and explosive materials. He also claimed he blew the fingers off his left hand while experimenting with explosives. He lived in Eureka, California but later moved to Arkansas, where he continued to publish his newsletters. His books were handled by small publishing houses that also put out military manuals, survivalist books and other niche interests. Saxon claimed to have been invited to appear on David Letterman. As Saxon tells it, he volunteered to demonstrate recipes from his book Granddad’s Wonderful Book of Chemistry, including the spontaneous combustion of mercury, potassium and sodium, and his “burning ice cube” trick. Unfortunately, during rehearsals one of his tricks ended with a boom and a producer yelling, “Am I bleeding? I can’t hear. Can I get this stuff off my pants?” Letterman allegedly cancelled Saxon’s appearance. After the turbulence of the ‘60s, Saxon seems to have turned away from far-right politics to concentrate on survivalism, a term he claims to have coined. “Survivalists,” according to him, were people who wanted to get away from a world of violent crime, urban riots, “militant rightists and leftists” and government bent on gun confiscation. Survivalists would need the means to defend themselves. Through The Poor Man’s James Bond, Saxon would teach them. Spanning four volumes, The Poor Man’s James Bond newsletter totaled nearly 2,000 pages. It was almost entirely devoted to building and maintaining tools of violence. It was MAKE magazine for people interested in weapons. The newsletter featured instructions on silencers, zip guns, concealable rocket launchers, fire-ball spitting cannons and much, much more. It covered lethal booby traps of every variety, from land mines to blowing up cars to electrifying welcome mats for dealing with pesky salesmen. Advice on poisons was down-home and casual. 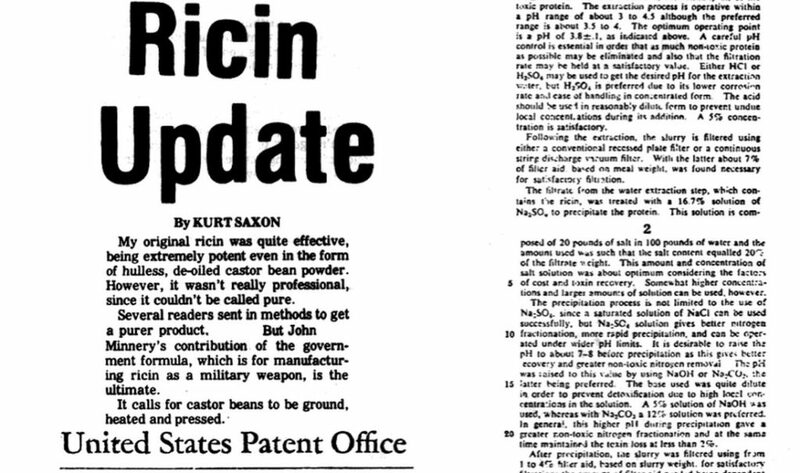 The Poor Man’s James Bond advised taking rhubarb leaves, which are deadly poison, and “just chop up some leaves and put them in the salad or stew or among the lettuce on hamburgers and you will have hit the jackpot.” Saxon also gave advice on ethylene glycol (antifreeze), arsenic, prussic acid, sodium fluoride, ricin and others. Want to make gas your specialty? Saxon explained how to make sulfuric acid and chlorine gas. An article on creating “cyanide smudge pots” claims its usefulness for dealing with armored columns, suggesting that the smudge pots could be used to gas the vehicle crews and then take their stuff. Planning to make explosives in the privacy of your own home? A recipe for gunpowder is one of the more innocuous recipes contained in the book, which also has instructions for mercury fulminate, dynamite, napalm, nitroglycerin and several nitrate-based explosives. The 1980s was the decade America discovered the ninja, a subversive Japanese assassin after Saxon’s own heart. The Poor Man’s James Bond featured several articles on ninja weapons, including nunchakus, caltrops, knife-throwing and jiu-jitsu. One article pondered the manriki-gusari, a weighted fighting chain fancied by ninjas. Saxon suggests using a dog leash chain and fishing sinkers to fashion an improvised version. For more modern suit-wearing ninjas, Saxon had instructions on how to build your own firearm silencers. There is the suitcase gun, a modified Ruger Mark III target pistol fitted with a silencer and hidden inside a suitcase. An electric toothbrush and batteries connect to a button near the handle for covert operation. At times the diagrams look like a collaboration between Wile E. Coyote and a bored junior high school student. The electric toothbrush-powered suitcase gun is one of many examples. The instructions for converting AR15 and Mini-14 rifles to fully automatic are difficult to follow; I’ve owned both rifles and had difficulty following Saxon’s hand-drawn diagrams. The lack of attention to detail in weapon diagrams calls the accuracy—and safety—of poison and explosive recipes into distinct question. Still, in many cases, the diagrams look at least passably plausible and even if they aren’t perfect, a determined person with a little imagination and tools might be able to close the gap. 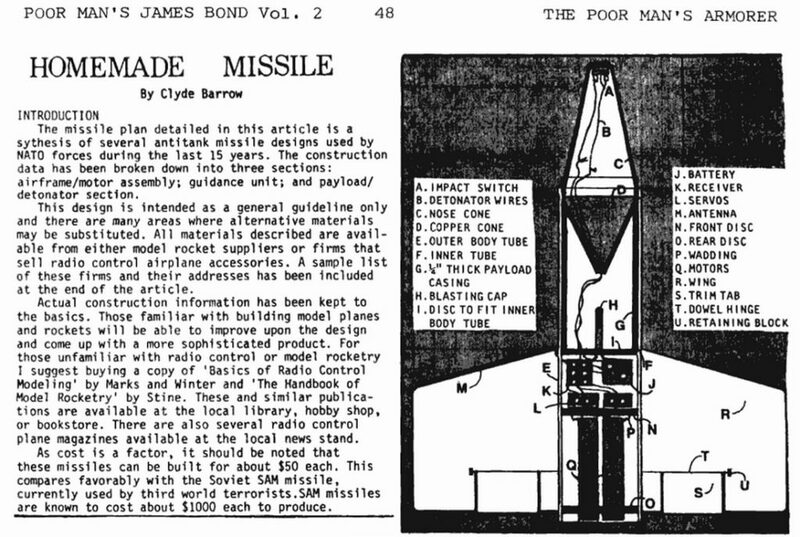 One of the more interesting—and lavishly illustrated—designs in The Poor Man’s James Bond is a ground-launched, anti-tank guided missile. The missile is equipped with a shaped-charge warhead, the kind used to destroy vehicles in Iraq and Afghanistan. Range of the missile is not specified, although the rocket engines used have a burn time of three seconds. 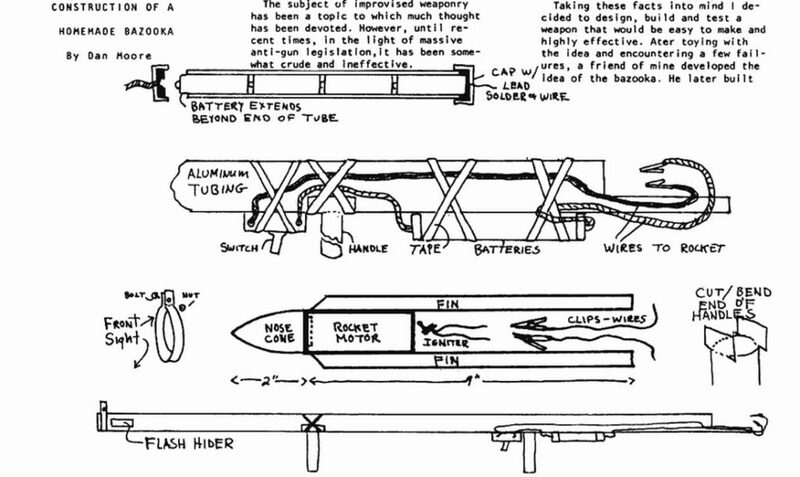 Saxon describes the home-brew missile as a something that could be built at home for “about $50 each,” noting that regular missiles made by defense contractors cost $1,000 each. Obviously this makes Saxon’s missile a real bargain, especially for something that could take out a $10-million-dollar tank. However, as ingenious as Saxon’s plans are, they are also possibly fantastical. Stubby with large control fins, the missile bears a similarity to the Soviet AT-3 Sagger anti-tank missile. The missile is propelled by four model rocket engines, with weight kept to a minimum by using balsa wood and paper. The warhead is described as a two pound shaped charge, detonated by an impact switch. The firing button is made from a doorbell ringer. It’s not clear how viable Saxon’s missile design is. Reading the instructions, one doesn’t get the impression that anyone had actually built it before publication. The section on how to make the guidance system work is murky and lacking detail. The instructions advise using a wrapping paper tube to help create a shaped charge, something that sounds dubious at best. In many ways, the missile appears to exist solely in the world of theory. One of the most inventive weapons in The Poor Man’s James Bond is based on the humble nasal spray. Nasal sprays are designed to puff a fine mist of antihistamines into your nose to relieve stuffiness. They are easily obtainable over the counter in any supermarket or drugstore. Small, lightweight and foolproof in design, nasal sprays are easily emptied and easily filled again … with something else. You can probably see where this is going. 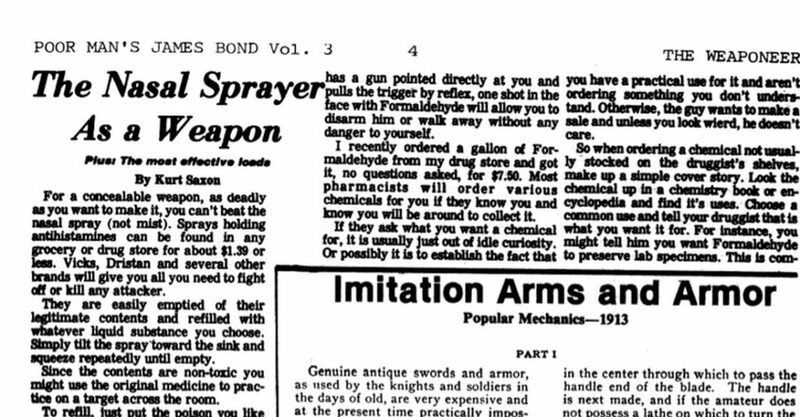 The Poor Man’s James Bond recommended emptying the sprayer and replacing it with formaldehyde. Saxon says that the chemical, sprayed into the victim’s face, would cause “terrible pain in the eyes, nose and mouth.” Formaldehyde “will stop the strongest man” for about 30 minutes, allowing you to disarm your attacker or make your escape. Saxon recommended obtaining Formaldehyde from unsuspecting or gullible pharmacists. Not all of the spray bottle fillers were nonlethal. Saxon recommended several lethal substances, including Black Leaf 40, a commercial pesticide that until 1992 was available in hardware stores and nurseries in the United States. Black Leaf 40 was extracted from tobacco and contained 40 percent nicotine sulfate. Readily absorbed through the skin, the substance attacked the nervous system and in sufficient doses was lethal to humans. By volume four of The Poor Man’s James Bond newsletter, it became clear that Saxon was running out of ideas. The final volume had some interesting writing by Saxon on improvised explosive devices, but it most consisted of reprints from army manuals, gunsmithing and reloading books and treatises on hand-loading bullets. Today original copies of The Poor Man’s James Bond newsletters are considered collector’s items and worth hundreds of dollars. The Kurtsaxon.com Website apparently sold DVDs of his writings, but the links are dead. PDF scans of the newsletters are easily available on the torrents. Despite being aware of the books for nearly 30 years, I only recently got around to sitting down and reading them. Given Saxon’s reputation in the media as a violence-advocating, dangerous right-wing racist I was surprised at how mild—relatively speaking—the writing actually was. Saxon is obviously a highly intelligent and humorous individual. It can be hard to discern the line between Saxon’s acerbic sense of humor and something much more disturbing.